Following the 1956 Official Language Act, the 1978 Constitution of the Republic of Sri Lanka in Article 18 declared "the Official Language of Sri Lanka shall be Sinhala". It was only the 13th Amendment to the Constitution in 1987 that Tamil was legislated as an Official Language. The 13th Amendment also introduced English as a link language. Amended Article 18 of the Constitution thus reads as. A legal awareness programme for schoolchildren was conducted by the Legal Aid Commission at Tholangamuwa MMV, Warakapola recently. The programme was funded by the People’s Bank. 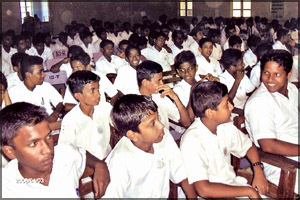 Here Legal Aid Commission President S.S. Wijeratne addressing schoolchildren. English shall be the link language. Parliament shall by law provide for the implementation of the provisions of this Chapter. Despite the Constitutional Provisions, so far no effective steps had been taken to implement the provision of Tamil as an official language and English as the common or the link language of the country. India in its Constitutional wisdom retained English as an official language despite a more protracted fight for independence from British Colonial Rule. India constitutionalised Hindi as the National Langauge and different State languages such as Tamil, Karnataka, Telegu, Punjabi, etc., as languages of the particular States. The multi linguistic Indian society where English, Hindi and state languages are simultaneously used by Indians in different states is the product of this far sighted policy. India retained the use of English as a recognised language and consequently, today, India boasts of over 300 million English speakers in the country; the largest English speaking population in one country in the world. Purists in the East and West, who specialise in condemning everything Indian, talk of a guttural Indian accent as English, but those who are familiar with Indian intellectual interventions in the International fora are amazed at the effectiveness of such interventions. Further the new English writing is enriched by Indian writers such as Arundathi Roy, Sashi Kapoor and Naipul. 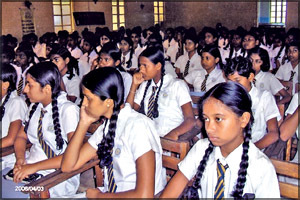 The Presidential project to bring English teachers from Inda to trigger a revolution in English teaching as a life skill in Sri Lanka is very appropriate, as India could be the source of low cost education of English available close at hand. Langauge learning during the colonial times was coupled with an immersion in colonial cultural values hence the negative reaction for everything English at the time of independence. But Indian teachers are imbued with Asian values and it would be an easy infusion of English linguistic skills without the negative cultural baggage. Effective English education should start from the most remote rural schools which could also transform their surrounding rural communities. A successful net community has been built in Mahavilachya where English education, internet and Wi Fi education are combined. Some of the poor students are engaged in simple projects to service a few Colombo business clients. Another significant project had been launched at the Ketawela Junior School, Mawathagama by the Rotary Club, Colombo West. A dedicated teacher at the school has developed an English speaking village school that was able to secure 100% passes in English at the last GCE (O/L) examination even participating in Toast masters activities. A separate foundation had been established with a Trust Fund of Rs. 6 million to develop English and internet capacity of the youth in the village so that students can enter the services of the internet industry. If the experiment succeeds, other service organisations and business houses with a sense of corporate social responsibility can replicate the project in other villages. Hema Henry Basnayake, Q.C., was born on August 3, 1902 and was called to the Bar on March 9, 1927. (Rumour has it that he first took to engineering). He joined the Attorney-General's Department on June 20, 1932 as a Crown Counsel. Between October 4, 1937 and September 30, 1938 he functioned as Commissioner for the preparation of a new and revised edition of the Legislative Enactments of Ceylon. Between January 4 and August 1, 1944 he functioned as Assistant Legal Draftsman. On October 1, 1944 he was appointed senior Crown Counsel and at various times in 1945 and 1946 acted as Solicitor-General and Attorney-General. He was appointed Solicitor-General on March 1, 1946 and the dignity of silk was conferred upon him in 1946. After serving on the Bench of the Supreme Court from October 1947 for four years, he was appointed Attorney-General on October 11, 1951. On January 1, 1956 he was appointed Chief Justice and served in that capacity till his retirement in July 1964. He was appointed Commissioner for the purpose of preparing a new and revised version of the Legislative Enactments of Ceylon in 1956. Question: Could you kindly let me know through your Daily News Legal Aid page the services rendered by the Department of National Archives and the services rendered to the public? 1. Provide historical and administrative information. 2. Provide facilities as a research centre to administrators and the public. 3. Reprographic facilities, such as microfilming, digital scanning and reader-printer copies. 4. Advise to public offices on Records and Archives Management. 5. Assist private sector on records and archives management. 6. 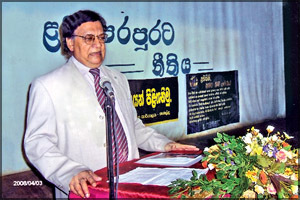 Advise to J. R. Jayawardena Research Centre on professional activities. 7. Advise to public offices on microfilming of records. 8. Technical and Scientific advice on conservation and restoration of records. 9. Organise exhibitions on record and affiliated activities. 10. Produce documents in Courts and giving evidence on request. 11. Research on Sri Lanka history. 12. Conduct lectures on archives and records management and conservation. 13. Prepare publications on professional themes. 14. Issue licence to export books and records pertaining to Sri Lanka. 2. Search and issue of certified extracts to the public from the following documents and give evidence in courts in respect of produced documents. 3. Search and issue of certified extracts to the public from the following documents. For legal purposes and give evidence in courts in respect of produced documents. Department of National Archives, P. O. Box 1414, No. 7, Reid Avenue, Colombo 7. The opening hours are from 8.30 a.m. to 4.00 p.m.
Financial transactions - 8.30 a.m. to 3.00 p.m.
Closed on public holidays. However E-mail and fax machines are in operation for 24 hours everyday. Can I amend my old Identity Card? Question: I have an identity card which was issued by Registration of Persons Department in 1988. Presently my appearance and my place of residence have changed. Can I have a new identity card instead of the old one? Further I want know whether there is any way to include my designation in the new identity card? Is it a punishment to keep the old one with me and apply for a new one? Your early response may be appreciated. Answer: Under the Registration of Persons Act No. 32 of 1968 and the amendments made to the Act in 1981 it is prohibited to keep two identity cards with you. According to your query you can apply for a new coloured identity card instead of the old one. You have to get the application from D.R.P/V/8 (form in pink colour paper/form printed in letters in pink colour) from your Grama Niladari. The following amendments to identity cards issued by the Department can be made on requests made by applicants. The change of appearance in the photograph of the identity card when compared with that of a present photograph of the person. The need to change the name. The change of address due to change of residence. To enter the new designation owing to the change of the occupation or the present post. The entries in the original identity card are illegible, Identity Cards being worn-out and torn due to various reasons. Issue of new identity cards to replace old identity cards issued from 1972 to 1974. The following documents should be submitted for amendments in identity cards: The old identity card. Certificate of employment (if employed) obtained within three months. Copies of colour photographs (1 3/8" X 7/8"). Stamps to the value of Rs. 15.00. If the name, date of birth and relevant particulars in the old identity cards have changed or are illegible, the original of the birth certificate or originals of the alternative documents mentioned above should be produced. If married women request to include the name of her husband in her name, the original of the marriage certificate should be forwarded. If the applicant has become a priest, Samanera certificate or a letter stating the date of robing, Samanera name and lay name from the robing Acharya/Upadhyaya (tutor) should be produced. If disrobed, a letter stating the date of disrobing, certificate of disrobing or letter with the name given at robing along with the lay name, should be furnished. Applications should be obtained from the Grama Niladhari of the Division where the applicant resides and in the case of estate residents and school students, applications should be obtained from the relevant Estate Superintendents and the principals of schools respectively, and duly completed applications should be completed and returned to them. You can get the new identity card via your Grama Niladari or the Registrar of Persons Department (address given below) through its one day service after paying the relevant fees. Registration of Persons Department, C45, Keppetipola Road, Colombo, Tel No. 0112508022, 01125833199. Functions and jurisdiction of Magistrate's Court and High Court? Question: Please let me know the functions and the jurisdictions of the Magistrate Court and the High Court? Your reply would be greatly appreciated. Magistrate's Courts: Magistrate's Courts are established under the Judicature Act, No. 2 of 1978 for each Judicial Division in Sri Lanka. The territorial limits of each judicial division is as determined by the Minister in charge of the subject of Justice in consultation with the Chief Justice and the President of the Court of Appeal. There are 74 judicial divisions in Sri Lanka. Sittings of the court are held in a convenient place within the territorial jurisdiction of the division, as appointed by the Minister by Regulation made under section 5 (3) of the Judicature Act, No. 2 of 1978. Every Magistrate's Court is vested with original criminal jurisdiction (other than in respect of offences upon indictment in the High Court), and is ordinarily empowered to impose sentences upto a fine of Rs. 1,500 and/or 2 years rigorous/simple imprisonment unless power is vested in the Magistrate's Court to impose higher penalties by special provision. All Magistrates are appointed by the Judicial Service Commission which is also vested with the power of dismissal and disciplinary control of the Judges. Appeals from convictions, sentences or orders of Magistrate's Courts within a Province lie to the High Court of the Province. District Courts: District Courts are established under the Judicature Act No. 2 of 1978 for each judicial district in Sri Lanka. The territorial limits of each judicial district is as determined by the Minister in charge of the subject of Justice in consultation with the Chief Justice and the President of the Court of Appeal. There are 54 judicial districts in Sri Lanka. Sittings of the court are held in a convenient place within the territorial jurisdiction of the district, as appointed by the Minister by Regulation made under Section 5 (3) of the Judicature Act, No. 2 of 1978. Every District Court is a court of record and is vested with unlimited original jurisdiction in all civil, revenue, trust insolvency and testamentary matters other than such matters as are assigned to any other court by Law. Jurisdiction in respect of commercial disputes which are greater than Rs. 3 million in value and arising in the Western Province, is exercised by the High Court sitting in Colombo - vide High Court of the Provinces (Special Provisions) Act, No. 10 of 1996. All Judges of the District Courts are appointed by the Judicial Service Commission which is also vested with the power of dismissal and disciplinary control of the Judges. Appeal from judgements, decrees and orders of the District Court lie to the Court of Appeal. Question: I have found employment through a relative living abroad (Middle East). Please let me know the correct steps to be taken before leaving the island. 1. Bank slips with the banks endorsements. If the documents are in order the officer would issue the necessary approval by endorsing the registration stamp on your passport.